The City of Batesville operates the beautiful Oaklawn Cemetery. 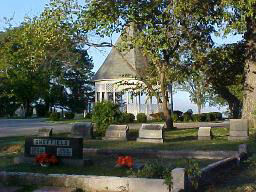 The original 24 acres of the cemtery were purchased by the city on June 15, 1872. The unique grave markers, old trees, well maintained landscapes and paved streets make this cemetery a lovely place to visit. The Thornesberry A. Gray Addition to Oaklawn Cemetery was purchased on August 10, 1993. Oaklawn is located on Myers and Sidney Streets. 1. Elisha Baxter, 1827 – 1890, Tenth Governor of Arkansas. 2. Marion Wilson Kennedy, 1850 – 1890, Sister of President Woodrow Wilson. 4. John P. Morrow, 1907 – 1978, Grave faces South. 5. Harve Osborne, 1812 – 1930, 118 years old, oldest person buried in Oaklawn Cemetery. 6. Ramsey Family, Ramsey Mountain named for family. 7. A.H. Joblin, 1842 – 1899, Town Alderman when the land for the cemetery was purchased, June 15, 1872. 8. Charles Kelly, 1779 – 1833, 1st Sheriff of Independence County. 9. Issac J. Long, 1834 – 1891, 1st President of Arkansas College. 10. Robert R. Case, Purchased first cemetery lot, December 13, 1872. 11. Edwin Burr, 1816 – 1876, Possible relative of Aaron Burr. 12. Arkansas Brigadier General AGC NGUS, Lucien Abraham. 13. Capt. Andrew Randolph Porter, Killed at the Battle of Buena Vista Mexico, February 23, 1817. The phraseology of his epitaph Is most unusual and beautiful. 14. Rear Admiral USNR Morgan Allen Powell, 1901 – 1979. 15. There are over three hundred veterans buried in Oaklawn Cemetery.